Anyone ever considered going to a breakfast club meeting? I’ve been to quite a few, so I thought I would explain what they are all about. The breakfast club season is about to begin, with Shelsley Walsh holding their next on March 8. Shelsley is the oldest operation motorsport venue in the World! I think it was Goodwood who started breakfast clubs. They are essentially meetings of like-minded enthusiasts who bring their cars to a themed day at the circuit, simply park their cars and wander off to look at other cars or have breakfast from a number of outlets at the circuit. It’s totally free – apart from the breakfast, of course. You stay as long as you want. Since Goodwood started it, at least a couple of other events have arisen: my nephew took up the Goodwood baton for the Midlands at Shelsley Walsh and Prescott naturally followed. The general format is that breakfast meetings are held on a Sunday at least once a month, although Goodwood have reduced them in that they don’t have one in March or April due to the members’ meeting, nor July because of the Festival, nor September because of the Revival. And they don’t have them in December, January and February for obvious reasons. Unlike the two hillclimb venues, Goodwood sets a theme. It might be a national one: French, Japanese, Italian or German cars. It might be a style of car: convertible (soft top Sunday, also moderns), SuperCars(which would include moderns), they’ve started to include a day for V8s, thoroughbred cars (not sure what that includes), pre-1966 (very much the cut-off year for the circuit). At Goodwood these days, you are asked to register beforehand so that they know how many people are likely to attend. 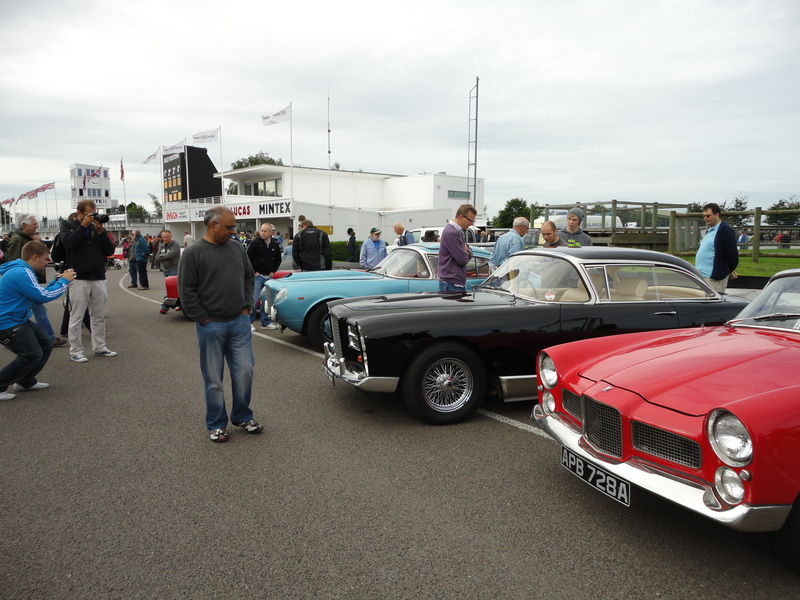 In the case of a rarity like a Facel, you might well be asked to park on the grid, which is the hub of the event, or even in the paddock. Otherwise, you might stretch to Woodcote and then down the Lavant straight, or towards Madgwick. However, there are restrictions at both corners as the airfield continues to be used. Ideally, you turn up before 8am because even then it can be pretty lively. You can leave when you want. His Lordship might well turn up in something suitable and park by the pit lane entrance. I went to two Goodwood events in 2014: Supercar Sunday and Soft top Sunday. Both, I would estimate, were attended by around 1000 cars on the circuit and around 15,000 people. I should add that you can turn up in a non-themed modern or classic and you will be directed into one of the usual car parks and then walk to the circuit from there. The car parks are sometimes as interesting as the cars on the circuit. I’m afraid we conned our way into the circuit on SuperCar Sunday with the Facel 11 having failed to pre-register. We shared the track with hundreds of Porsches, Aston Martins, TVRs etc, plus rarities such as Bentley GT3, Pagani Zonda, at least three McLarens plus quite a few Ferraris of varying ages, surprisingly few E-types and one Gordon Keeble. Motoring journalist Steve Cropley tweeted that his favourite car was an ‘ageing Facel 11’ being kind enough not to mention the ageing driver. We also took the Facellia to Soft top Sunday where there were surprisingly few basic British staple fare such as TRs, MGs etc. But again, there was a huge turn-out. I had pre-registered and in theory had a pass to get onto the grid but I chose the wrong entrance and in spite of my pass, was told that there was no longer space on the grid (rubbish) and that I should park on Lavant straight. My own fault, should have gone in the main entrance – I’ve only been going to Goodwood since the fifties. There are frequently gripes about traffic – now much better – and ‘why such and such a car was allowed’ but generally speaking, I found the atmosphere and accessibility were superb. I know from nephew Mark that Shelsley is a lot more relaxed with fewer people and the cars park in the general car park rather than up the hill, but like Goodwood, where the brand in general has been greatly enhanced, attendances are slowly rising as classic car owners seek somewhere just to talk cars on a Sunday morning. Google all three venues and you will see what is on offer and when. Hope to see you there. 2015 Goodwood breakfast club dates: May 3, SuperCar Sunday; June 7, SoftTop Sunday; August 2, pre-1966 thoroughbred cars; October 4, Vee-power; November 1, Bahn-stormers (anything for storming Autobahns).